These stories co-written with Jî Drû, her longstanding partner, take place in the same setting: on the sand, on the edge of a forest, where the river flows into the sea. Times change, moods vary, characters transform themselves and everyone has an appointment with the Moon. They say it becomes red just before it disappears and we can all make a wish. An introspective and powerful album, we are carried from beginning to end by Sandra Nkaké’s majestic breath. The album was recorded by Jean-Baptiste Brunhes at Midilive studios from famous Vogue label. The musicians all settled in the big studio, equipped with amplifiers and vintage instruments, and recorded the whole project in live conditions. Sandra wanted this spontaneous and natural bias, offering us a straight and fragile album, full of temperament. Sandra Nkaké is one of the most moving voices in France: she has spread her personality and her talent throughout the most important festivals and stages in France and abroad. 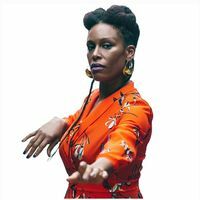 Tangerine Moon Wishes is her third album; it will be released this fall via Jazz Village [PIAS] and promises to be one of the events in the music industry not to miss. RIOT under exclusive licence for the world to JazzVillage, a label of [PIAS].